This is rather good. 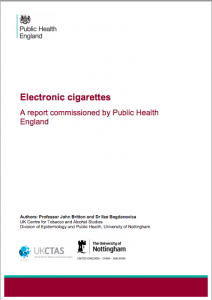 Public Health England commissioned a background paper on e-cigarettes from Professor John Britton and Dr Ilze Bogdanovica of Nottingham University and UK Centre for Tobacco and Alcohol Studies. It is a relief to read good, evidence-based, optimistic reasoning from top figures in public health, and to have this commissioned by England’s main government public health agency. I’m sure there are things that I might have said differently in the report, but I can’t disagree at all with the positivity and vision of the summary and conclusions. Smoking kills, and millions of smokers alive today will die prematurely from their smoking unless they quit. This burden falls predominantly on the most disadvantaged in society. Preventing this death and disability requires measures that help as many of today’s smokers to quit as possible. The option of switching to electronic cigarettes as an alternative and much safer source of nicotine, as a personal lifestyle choice rather than medical service, has enormous potential to reach smokers currently refractory to existing approaches. The emergence of electronic cigarettes and the likely arrival of more effective nicotine-containing devices currently in development provides a radical alternative to tobacco, and evidence to date suggests that smokers are willing to use these products in substantial numbers. Electronic cigarettes, and other nicotine devices, therefore offer vast potential health benefits, but maximising those benefits while minimising harms and risks to society requires appropriate regulation, careful monitoring, and risk management. However the opportunity to harness this potential into public health policy, complementing existing comprehensive tobacco control policies, should not be missed. National Centre for Smoking Cessation and Training: E-cigarette briefing – surprisingly positive. Watch the vapers’ views of the PHE symposium: David Dorn hosts Oliver Kershaw and Lorien Sea on Vapour Trails TV – excellent! A great discussion that really brought the meeting to life for me. Dave Dorn’s impression of Martin McKee is sufficient reason alone to watch this. Although controversial, the Swedish natural experiment demonstrates that despite dual use and primary uptake of the reduced-harm product by young people, availability of reduced-harm alternatives for tobacco smokers can have a beneficial effect. While snus is not likely to become a legal or indeed politically viable option in the UK, this data proves the concept that harm reduction strategies can contribute to significant reductions in smoking prevalence. Or put it another way, bad law and lazy politics denies access to products that reduce smoking and cancer in the population as a whole, while giving smokers choices that substantially reduce their own risks. Something I call Death by regulation – and a point that was made to the Secretary of State for Health by several experts, when there was still time to do the right thing with the directive. Most of the researches focus on the political discourse regarding e-cigarette legislation, this doesn’t help smokers decide whether e-cigarettes themselves are a viable alternative to conventional cigarettes. But this reports has positive views. Clive on a unrelated matter- there have been a lot of reports recently about 3rd hand tobacco smoke (lingering on things like carpets) . While I am sure that there would be residues of polycyclic hydrocarbons and the like on house furnishings deriving from tobacco smoke- my instincts make me wonder whether they would be any higher than the residues left from things like wood smoke, coal smoke, diesel fumes (or the smoke traces left on smoked foods for that matter) any idea as to how creditable are those studies Vz relative risks? Thanks Clive for a great summary, and in particular for links to the presentations. I too would recommend the VTTV programme, and also the excellent follow-up with Professor Robert West – who, to me anyway, seems to combine extreme smartness with the humility and a willingness to engage which can be less evident in some others in this field. Plenty to question and ponder, and Guardian / Observer has been a bit all over the shop on ecigs, but fascinating that in the debate about whether ecigs should be available on prescription they chose for the ‘anti’ position someone who thinks smokers should pay for their own, rather than arguing that they don’t work / explode / poison children / kill dogs etc. Have you read this tripe from the EU Commission? E-Cigarettes Myth Buster http://ec.europa.eu/health/tobacco/docs/tobacco_mythbuster_en.pdf Deliberately evasive and misleading. Yes, very mislesding. To rub it in, the ecig in the image at the bottom of the article will be banned by the EU as it can’t be refilled without the possibility of leakage. Perhaps it doesn’t contain nicotine. #7. Only ecigs containing nicotine are covered. What a mess. What exactly is covered by the ban? Kettles? lithium iron batteries? Very thin wire? small containers? In other words for the directive to be effective (and not just BS) it would need to police the personal importation of nicotine containing e-liquid, from china. That would be a very large project. Thanks for the fulsome (and rather unexpected!) response. I do not expect a response to this missive! Note that I am NOT saying that smoking is innocent of all charges. What I am saying is that there seems to be a combination of many factors involved. Some people should not enjoy tobacco, and some people should wear a surgical mask whenever they venture outdoors. Dirt is everywhere and the atmosphere is filthy. Our deaths are in our genes. Tobacco Control does not ‘save lives’. At best, it ‘postpones deaths’. I’m afraid that the continuing EU ban on snus (and especially the UK Government’s acceptance of that ban) rather pores cold water over any suggestion that Tobacco Control is weakening its attitude to e-cigs. It seems rather more to be mollifying,in much the same way that there were originally proposals for exemptions to the smoking ban, but which were dropped at the last minute by an amendment proposed by the Government itself to its own Bill.But I agree that the statements which you refer to imply the possibility of a change of heart, but the statements are phrased is such a way as to be deniable when necessary. We who enjoy tobacco have seen too many dirty tricks from Tobacco Control in the past decade or so and so vapers should be aware that they can place no trust in any statements from anyone involved in Tobacco Control. The twists and turns are all very depressing. I think tobacco control activists are consistent in the sense of consistently anti-smoking – and aiming to reduce this to the extent possible. They vary in their objectives: there are those grounded in “non-smokers’ rights” and others with a public health focus on reducing smoking related diseases in smokers – quite different objectives. Some have greater concern about initiation (‘the children’) and others about quitting. There are variations between them in respect for personal choice and individual agency, attitude to markets, and their willingness to rely on or pervert science, economics and law to try something they hope might work. Into this mix there are a number who are instinctive prohibitionists, doctor-knows-best authoritarians, and anti-corporate activists, whose purpose is to do battle with the tobacco industry. There are some very good rigorous and ethical people, and – um – let’s just say people who serve no useful purpose and cause more harm than good. I’d say there is a big split on ‘harm reduction’ but it is mainly between activists and experts (with a few exceptions on each side). The experts now increasingly recognise it as an effective anti-smoking phenomenon (I refuse to call it a ‘measure’ or ‘intervention’) and, unusually for the tobacco control play book, it does not involve coercion, prohibitions, fear or public spending. That’s why I am a supporter of e-cigarettes, snus and non-combustible nicotine products in general from a public health perspective – they result in very good outcomes but go with the grain of user choice and empowerment, liberal market based behaviours, cause no harm to others and require no transfers through the tax system. They need some regulation, but primarily to build consumer confidence and set reasonable standards for health and safety – as with food, for example. The regulation needs to be purpose built and designed for the category, not contrived from regulation designed for an entirely different purpose. The snus ban is an utter disgrace – and one day I hope there will be a reckoning for the tiny cabal of clueless ethically bankrupt activists who decided in the face of all evidence and expert advice that it was a good idea to maintain the 1992 ban in 2014. The intervening 22 years has done nothing but provide evidence that it was having benefits to health in Sweden and Norway far larger than any of the measures they support, with none of their imaginary ‘concerns’ ever emerging. I genuinely see hope in the recent developments. The speakers at the PHE conference such as Fenton, McNeill, Britton and West are highly respected – and I recommend the VTTV discussion of the symposium. They are increasingly vocal supporters and now confidently on the record on these issues, and backed with data. They are the people that the followers in public health ultimately listen to. Now all of that needs to translate to a better approach to regulation than either the crushing burdens of medicines or arbitrary nonsense of TPD, otherwise we’ll have another snus fiasco on our hands. But a change in attitude is a prerequisite for a change in policy. It’s Sunday morning and I’ve droned on way too long – and the dog is looking as though she feels abandoned. So it’s off to Tooting Common for me. “… they result in very good outcomes but go with the grain of user choice and empowerment, liberal market based behaviours, cause no harm to others and require no transfers through the tax system.” totally agree- as for regulation the only regulation needed is essentially the same as for food/alcohol purity (or possibly over the counter pharmaceuticals) but that’s all. This is especially so because nicotine consumption (as apposed to Smoke in public places) is in itself not a issue re public behavior/hazards. Mind there is a significant section of our community(s) for whom making and enforcing Regulation is both a job and a source of social status. Clive Bates: Public Health England goes *Positive* on e-cigarettes! While the documents posted by Clive about the PHE seminar represent a welcomed sea change of honesty by some in the UK government on the scientific and empirical evidence of e-cigs, none of them criticized (and many continued to strongly endorse) the MHRA regulation that will ban >99% of e-cig products now on the market (including all mods and e-liquid) by 2017, will give the e-cig industry to the large tobacco companies, will threaten the lives of most vapers and smokers, and will create a black market for e-liquid (and maybe mods). If the UK government (like the US government) was truly interested in reducing smoking and protecting public health, it would have carefully evaluated the scientific and empirical data on e-cigs BEFORE proposing (and in the case of UK, finalizing) a nonsensical mandatory regulatory scheme for e-cigs that bans nearly all of them. It is somewhat sad that we vapers now cheer a public servant who supports medregs.He then,strangely, goes on to point out the advantages of the TPD alternative over medregs.Perhaps the debate was always between the banners and the total controllers.The biggest battle may well be the review of the evidence by the Commission in May 2016 – the last chance for the banners to win. Unlike the FDA,UK PH/TC cannot bring themselves to address the impact on the industry of either form of regulation – I still think they see ecigs in same medicinal light as NRT with 6 or 7 slightly different products emphasising innovation and choice and being more than enough to be effective for the vast majority. Like political parties,they talk about their concern regarding the risks of getting the regulatory framework wrong then blindly go ahead and follow their particular ideological path and are shocked when we protest. I don’t wish to say anything at all positive about the UK/EU regulatory environment. Just that a change in underlying attitude is essential to fix this in the longer term. The FDA is later to the party and is much more rigorous about due process – but the underlying attitude from both CDC and FDA is not very encouraging, to say the least. Bill’s point is spot on: without considering it necessary to wait until the huge public potential for e-cigarettes was established (or the imagined risks emerged), the authorities in Europe rushed into botched regulation on the assumption it was all risk and little benefit – only to find that e-cigarettes and harm reduction are working well without their involvement. To many of us this is no surprise as it has been clear for some time to anyone prepared to listen to users, assess the technology and engage with the data that did exist that e-cigarettes were a major positive and disruptive health technology. The EU legislature was presented with a perfect opportunity on 8 October 2013 to pause and rethink, when the European Parliament rejected compulsory medicines regulation for these products. It was obvious then that MEPs were concerned and that the policy of governments (medicines regulation) had been thwarted. The problem was that they didn’t then take the e-cig/NCP issue out of the directive, rethink and craft something new and fit for purpose. Instead this arrogant institution decided that getting a policy deal was more important than good policy and due process. So they pressed on in secret negotiations without consultation and with casual disregard for science and created the mess that is the TPD. All based on no evidence at all. So now we have an emerging success story with data that convinces the most austere scientists in the UK, and all this has been achieved with only the lightest touch general consumer regulation. By 20 May 2016, everything will be different – manufacture, import and sale of devices and liquids will be governed by massively burdensome medicine regulation, though no-one in authority can explain how it will work or what impact it will have, or a weird arbitrary set of controls cobbled together in haste and ignorance under directive 2014/40/EC. No one can explain what problems these regulations will solve, what opportunities they will realise, or why they are confident that these regulations will not have a deleterious effect on what appears to be working well without their involvement. Those are the questions we need to keep pressing – but getting the right answers will depend on a change of underlying attitude. That’s why I am positive about the signs from PHE… and they are a massive improvement on CDC. Clive – thank you for this lucid summary and synthesis. After attending TMA where I found at least some with which I agree (but much I did not–e.g., listening to a gentleman from Imperial, using wholly inappropriate methods and completely ignorant of the ITC project, assert that tobacco control policies are ineffective at reducing smoking), it was almost blissful to read Dr. Fenton’s blog and the underlying reports. I remain optimistic about how things will end up with the US (I am an optimist, unabashedly), but I can’t help but thinking that it might be faster and easier to just renounce the Declaration of Independence, have the Queen appoint Governor Obama to lead in the American Commonwealth (needs a better name…), and quickly have FDA adopt the mindset and approach of MHRA regarding tobacco and nicotine and yet retain FDA’s powers over combustible tobacco products. I’ve always liked curry and fish and chips… I like heavy coins… But learning to drive on the other side of the road would be a bear! I personally think that if the UK gets it RIGHT on e cigarettes, it could spill over so some sanity arrives in the rest of the world too. There seams to be a great melancholia towards the smoking era and its pleasure but it is not politically correct to speak about it. It surfaces in films and TV shows. The anti smoking industry must be aware of this too. Vaping relieves the grief and fills the hole left by prohibition. There is no way in hell, the prohibitionists are going to drop their stance against e cigarettes if they see them, as I do, as a substitute smoking, or indeed the “new” smoking. We need to remember, the anti smoking industry is huge, it needs a future. It has no morals, already has permeated all thought, is being funded by the people it persecutes and big money like Bloomberg. It is profitable employment. Whatever good news appears in Public Health will conceivably be poisoned by the anti smoking ideology, that is already in Public Health anyway. I agree that it would appear that elements of PH seem prepared to engage with both the emerging evidence and, especially, vapers themselves. It is a pity, however, that a great section of the senior medical profession remain to be convinced, as evidenced by the reported comments of the CMO and the continuing sceptical position of the BMA, for example. As far as I can see, we will still be strait-jacketed by the TPD and the likely opposition of senior medical figures which will leave us little better off, apart from being treated with a little more respect by PH. Ultimately, we are suffering from the basic lack of understanding, wilful or otherwise, of the use and benefits of e-cigarettes ‘in the wild’ by those with the power to make decisions. Even if that understanding is now gained, I fear that things have moved too far down the regressive path to be able to recover the ground that has been lost already. Is there any hope at all that we will finally see balanced and sensible regulation, that does not snuff out (no pun intended)Prof John Britton’s ‘Public Health Prize’? Tim – I broadly agree. The CMO should be ashamed of her performance at the PHE meeting. But steadily, one step at a time, people are becoming convinced. The snus example shows how bad politics can be in accepting evidence – but the difference here is that there are now 2 million vapers – enough to listen to and not offend. Given your ‘inside knowledge’ of Welsh Politics, can I ask how much influence you believe PHE might have on PHW ? PHW seem to be going in the opposite direction (as you already know), yet PHW and PHW are supposed to be ‘related’ ? Wales will take an independent view, and there is no direct relation. But they can’t fail to be swayed by the same evidence, ideas and people that are changing attitudes in England. They can blog away and write all the reports they want. I’ll wait to see what I can legally buy in 2017 and what I will have to buy on the black market – with the leakage and strength regulations I’m guessing everything. Glad to hear Dockrell has found a new taxpayer trough and that he is no longer a lying propagandist with no interest in scientific evidence. Jonathan – of course it is results that count. But the underlying attitude and intent of the authorities involved will make a great deal of difference in how laws are in place are interpreted and applied, and what happens if there is a legal challenge. It might also encourage them to make a genuine ‘light touch’ route through medicines regulation. The point is that it is necessary, but not sufficient, for them to have the right attitude and aim.